Every night, if a ship from the east or north arrives in the archipelago of the Seychelles, the captain of the vessel anticipates the detection of a flashing light located at precisely: 03 47.81’S, 055 40.02’E 95 km (59 miles) north of the main Island of Mahé. For one hundred and twenty-seven years, the light house of Denis Island has provided navigational safety to thousands of ships…. And yet it was not the colonial government’s voluntary decision to build a Lighthouse on Denis Island in 1881. 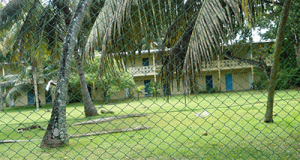 It was a peremptory demand made by the French shipping company, the Messageries Maritimes which had been operating regular services to the Seychelles since 1864. In early May of 1881, they informed the Chief Civil Commissioner Henry Cockburn Stewart(1844-1899) that their ships would discontinue their service to the Seychelles in January of 1882 if a lighthouse was not erected on either one of the two islands on the northern rim of the Seychelles bank. (Bird Island or Denis Island). Their concern was the dangerous shallows and treacherous breakers that exist in the vicinity of these islands, which rendered night navigation hazardous. Being aware of the potential dire effects that such eventuality could have on the economy of the archipelago, Chief Civil Commissioner Stewart could not ignore the warning. It was mainly the steamships of Messageries Maritime that brought passengers, goods and mail to the Seychelles, and that took the country’s agricultural produce abroad to the export markets. No time was wasted in deciding which of the two islands would be the ideal place for a lighthouse. Denis Island was chosen. This low-lying 350 acre sand cay, 1 mile long and 3 quarters of a mile wide, at the northern edge of the Seychelles bank was discovered by Jean François DENIS de KEREDERN, comte de Trobrian (…1730-1780) on 11th August 1773. With a general elevation of 8ft above the sea level, the island had a thick layer of guano that covered the surface of the phosphatic sand stone in many places. Casuarina trees grew inside the coastal fringe of veloutier, and besides the coconut palms, takamaka and badamier were the main features of the island. The obligation to build a lighthouse on the coralline island, far away from Mahé, came at an inopportune moment for the colonial administration of Seychelles which was ruled as a Dependency of Mauritius. 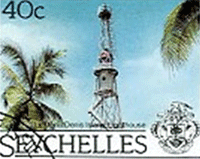 Almost a decade earlier, in 1872, a board of Civil Commissioners, and the country’s finances were separated from those of Mauritius – in preparation for Seychelles to be given complete colonial autonomy by 1903. In 1881, Henry Cockburn Stewart was temporarily replacing Francis Theophilus Blunt who had passed away in February at 44 years old. Even though the boom in vanilla production, together with the export of thousands of hectoliters of coconut oil was bringing in a considerable amount of revenue, the 37 year old acting Chief Civil Commissioner found that handling and managing the country’s earnings and expenditures meant walking on thin ice. And the cost of constructing a lighthouse which entailed the assistance of a mechanical engineer, the expert counsel of a builder, the work of labourers, and above all, the site for the infrastructure, had not been contemplated. 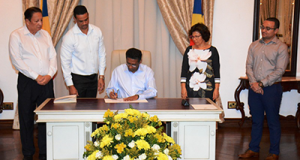 Nevertheless, to appease the ‘Messageries Maritimes’ concern, work began in August under the supervision of the superintendent of public works and the government surveyor, Jules Cauvin. It was decided that the lighthouse should be situated on the northern headland of the island. 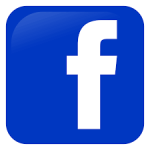 An acre of land, there, was leased from the guano company. But …..building a pharos on Denis Island was a task of Sisyphus! 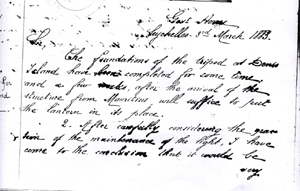 It was beset with difficulties ………….On the 10th of December, a tower of coral stones that had reached 40 feet foundered, causing severe injury to several labourers and prisoners who had been working on it. 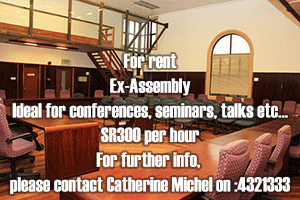 Consequently, work was suspended pending a commission of enquiry into the incident. In February of 1882, Arthur Cecil Stuart Barkley (1843-1890) arrived to assume his duties as the Chief Civil Commissioner. 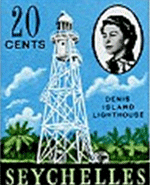 In spite of being preoccupied with other aspects of his administration-including, having to handle a petition from a group of inhabitants who were asking that the Seychelles remain a Dependency of Mauritius, and the establishment of secular education-the erection of the Denis island lighthouse remained an imperative feature on his colonial agenda. 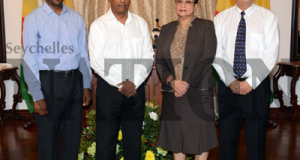 Increasing maritime traffic in the Indian Ocean maintained regular contact between Seychelles and the outside world. During 1881, 76 vessels had dropped anchor in Port Victoria which had received its lighthouse in 1876. However, work on the construction of the lighthouse remained in abeyance during the entire year of 1882. The ‘accident’ of 1881 was ascribed to the gross negligence of the superintendent of P.W.D, Jules Cauvin, whose imprudence in allowing a heavy tower of coral stone to be constructed on the sandy soil of Denis Island had nearly been fatal to the workers. Moreover, Cauvin, was accused of flogging prisoners. 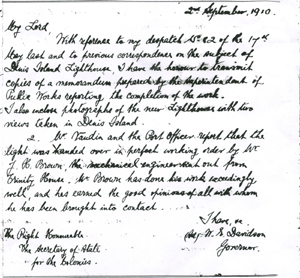 Barkly informed the Secretary of State for the colonies of his discontentment with Cauvin and requested that an officer from the surveyor general Department be sent to take charge of the P.W.D. Cauvin resigned in December of 1882. 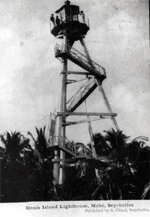 It is clear from the copious correspondences that the Chief Civil Commissioner dispatched to his superior in Mauritius, that he was eager to accomplish the erection of the lighthouse on Denis Island. In one of his reports on the subject, he advised against the erection of a stone structure and recommended that instead, ‘the lattice work principle in much use in America and which was employed in temporarily repairing the Grand River Bridge in Mauritius, after the hurricane of 1868’ would be suitable . He even enclosed a cutting from an American newspaper. 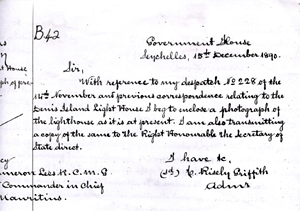 In December, of 1885, the acting chief Civil Commissioner, Georges Hollier Griffith wrote to the governor of Mauritius. Sir John Pope Hennessey (1834-1891) regarding the dilapidated state of the tripod which had been imported from Mauritius in 1883. He suggested that a new lighthouse of capucin wood be constructed on the outside of the rotten one.- instead of demolishing it, which would necessitate the discontinuation of the show of light for an indefinite period of time- after which the light apparatus would be transferred to it. Years passed, and besides slight reparation work to the decrepit structure, the major overhaul that it urgently required remained merely elaborately written proposasl on paper. Until 1840, when the administrator, Thomas Risely Griffith strongly recommended the construction of a masonary tower…..”it would be money better laid out in the interests of the Dependency to spend Rs. 14,000 for a stone Lighthouse than about £800, in adding three more wooden legs to the present structure…..? But, unsurprisingly, when the geological morphology and the topography of Denis Island was once again taken into account, Griffith’s sagacity was promptly ignored! In 1892, a new Lighthouse measuring 66 feet high was constructed with hard wood timbers. The Light was visible at a distance at 12 miles at all points of the compass. 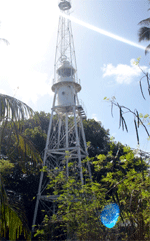 On the 20th December 1893, the new Denis island lighthouse was lighted. However the tropical climate has an insidious way of taking its toll on even the most durable timber wood, even capucin …..So that in March of 1907, governor Walter Edward Davison (1859 – 1923) reported to the Secretary of State for the colonies, the ‘unsound state’ of the Lighthouse structure on Denis island and strongly recommended that a new Lighthouse be constructed with a steel tripod that would bear the weight of two tons. Admired for his intuitive knack in practical matters, Davidson expressed his concern about the fact that he felt it unfair for the colony of Seychelles to bear the full cost of a new Lighthouse which would serve not only ships that come to Victoria harbor, but also ships on their Ocean journeys going elsewhere. He therefore, made a request to the Secretary of State, the Earl of Elgin and Kincadine, for Seychelles to apply for a grant-in aid contribution of £400 from Trinity House, towards the cost of reconstruction of the Denis Island Lighthouse. Trinity House was a corporation which was the authority in charge of the lighthouses, lightships and buoys of England and Wales. Founded in the 16th century, it had its headquarter on Tower Hill in London. In 1907, the Lighthouse keeper of Denis Island was Joseph Lascagne (1873 – 1918) who received on annual salary of Rs. 720. During the year 1909, the labourers worked in the scorching sun of Denis Island. The excavation work for the foundation was tough. Gradually a majestic structure of tubular steel began to sprout, 30 feet…. 70feet… 85 feet. A small store originally acquired with the land bought for the extension of Victoria market had been carried to Denis Island and erected for storing materials for the construction of the lighthouse. The materials were brought by a steamer of the German East African Line which had arrived on 22nd May, 1908. The iron fittings came from France, furnished by the firm Barbier, Bernard and Turenne at a cost of Rs 32, 490. It was in August 1910, that the lighthouse was completed with the assistance of J.H. Brown, a mechanical engineer from Trinity House. The project was expected to cost at least Rs 40,000 but instead, the precise sum spent on it was R59, 983.35 cts. The lantern of collodian mantles with flashing light of 70,000 candles intensity came from the English firm, Chance Brothers. It was a revolving device with vaporized kerosene as illuminant. The flashing light was visible at 25 miles. As for the old lighthouse of dilapidated capucin timber, it was dismantled and re-erected on Mamelles Island, where it was lit for passing ships for the first time on 15th December, 1911. So, during the next century, the lighthouse of Denis Island sent its light over the sea, winking comfortingly at ships on the ocean all around, as the lantern revolved on its mercury trough. Over the years, its steel tripod is painted regularly, and the lighting apparatus meticulously inspected. The casuarina trees on the island are regularly cut so as not to affect the arc of visibility. Like it has done for the last hundred years, and for many more years yet to come, it will continue to advise caution and alert to ships and vessels navigating the approaches to the island in good and in stormy weather. We cherish it, like a National Monument. The lighthouse of Denis Island.